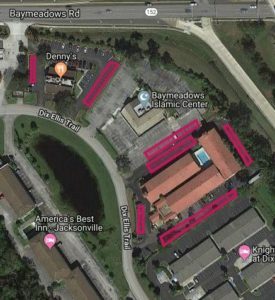 The mission of Baymeadows Islamic Center(BIC) is to establish a facility for the prayer, education and religious gathering for the Muslim Community of Jacksonville. Also to do all such activities that foster and promote Islam and its heritage as dictated in the Quran and the Sunnah (tradition) of Prophet Muhammad (pbuh) and promote Islamic values among Muslim Community of Jacksonville. – Due to parking issues at BIC and for the convenience of the community Insha’Allah BIC will have two Juma prayers starting from October 26, 2018. – For the benefit of those who may have difficulty with parking at BIC, below marked areas are the additional BIC allowed parking spaces during the Juma time. Also, there will be volunteers to assist in parking. Please DO NOT BLOCK your cars as there will be a Towing Company in place to take necessary actions at your own expense. – The BIC Board of Directors is putting together an updated Membership/Community Directory that will NOT be shared outside the board and will NOT be published to the community and will NOT be sold to anyone. Below is a link to add your name to the BIC list. 2) If you know that you have already completed a paper membership application, then please mark the correct box and enter your information to be included in the new directory. 3) If you do not want to become an official member, please mark the correct box and still complete the online form so that we can have a list of our community. The primary benefits of being an official BIC member are the ability to vote each year for the BIC Board of Directors and to run for a position on the Board of Directors. Membership applications are reviewed and approved based on an individual’s contributions to the BIC community, including non-financial contributions. Membership costs are $50 for students/senior citizens, $75 for single members, and $150 for family memberships.